RITES Notification is out. 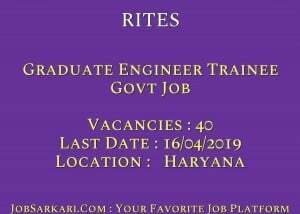 RITES is recruiting for 40 Graduate Engineer Trainee Govt Job Posts. You can check RITES - Rail India Technical And Economic Service last date, download RITES notification, visit RITES official website and check other RITES Vacancy details.Complete Vacancy and recruitment Details about 40 Graduate Engineer Trainee Govt Job vacancies in RITES are provided below by JobSarkari.Com only for you. Last Date of Apply Online. 16/04/2019. GET (Civil Engineering) Candidate Must Have Passed BE/B.Tech/B.Sc (Engineering) Degree in Civil Engineering. 24. Engineering) Candidate Must Have Passed BE/B.Tech/B.Sc (Engineering) Degree in Mechanical Engineering/ Production Engineering / Industrial Engineering / Automobile Engineering. 08. Engineering) Candidate Must Have Passed BE/B.Tech/B.Sc (Engineering) Degree in Electrical Engineering/ Electrical & Electronics Engineering. 02. Telecommunications) Candidate Must Have Passed BE/B.Tech/B.Sc (Engineering) Degree in Electronics Engineering/ Electronics & Telecommunication Engineering/ Electronics & Communication Engineering/ Electronics & Electrical Engineering/ Computer Science/ IT/ Computer Engineering/ / Electronics & Instrumentation Engineering. 06. Total No. of Post 40. 1. On Basis of Score of GATE – 2018 or GATE – 2019. 2. Candidate Need to Click on the Apply Online Link Given in Important Link Section. 6. Online Application Can be Submitted on or Before 16th April 2019. Q. What is the Last Date For RITES Graduate Engineer Trainee Govt Job Vacancy ? A. 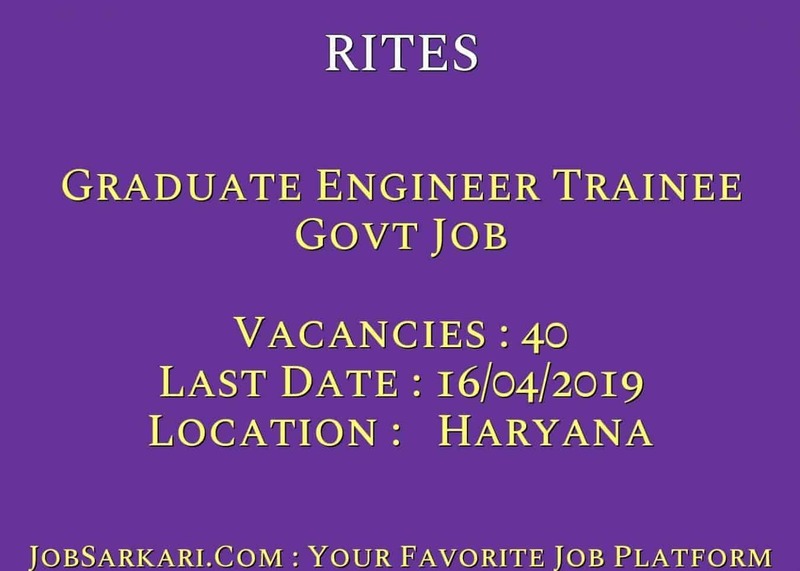 Last Date for RITES Graduate Engineer Trainee Govt Job Posts is 16/04/2019. Q. What is the Form Type of RITES Graduate Engineer Trainee Govt Job Recruitment ? A. The Form Type for RITES Graduate Engineer Trainee Govt Job Posts is Online. Q. How many vacancies are available in Rail India Technical And Economic Service Graduate Engineer Trainee Govt Job Posts ? A. There are about 40 Vacancies in Rail India Technical And Economic Service Graduate Engineer Trainee Govt Job Posts. Q. What is the Full Form of RITES ? A. Full Form of RITES is Rail India Technical And Economic Service .